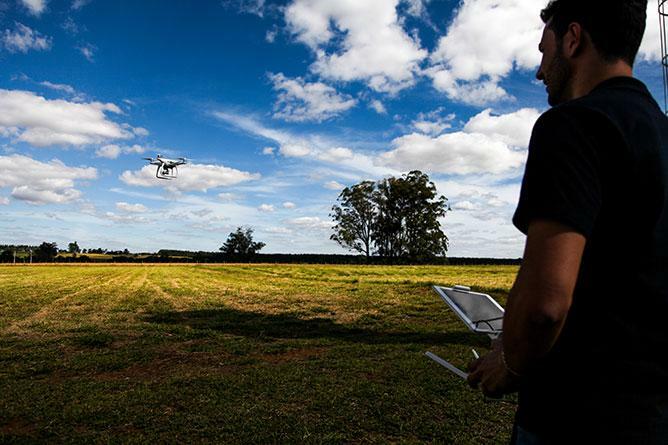 Similar to how mobile phones evolved from being a luxury item for the few into a ubiquitous tool that’s improving people’s lives globally, a new Qualcomm® Wireless Reach™ funded program in Brazil aims to achieve the vision of a drone on every farm. The Drone Technology Development Program for Precision Agriculture was launched in Sao Carlos, Brazil on June 30, 2016, and it is a collaboration between Qualcomm Wireless Reach, the Brazilian Agricultural Research Corporation (Embrapa) and the Institute of Solidarity Socioeconomics (ISES). The program aims to demonstrate how drone technologies can be applied to reduce environmental impact and increase crop yields. The on-board systems developed for drones will combine Embrapa’s expertise in agriculture and image processing algorithms with the strong performance of the Qualcomm® Snapdragon Flight™ drone platform and advanced wireless technologies to collect, process, analyze and transmit real-time crop intelligence to farmers and environmental stakeholders in Brazil. This is particularly relevant for Brazil because a significant part of its economy is based on agriculture, and the country is a world leading producer and exporter of many crops. A vast majority of the about 4-million farms in Brazil are very small and are known as “family farms.” The family farmer is recognized as a pillar of national development; family farms account for about 70 percent of the country's staple food production and employ three quarters of farm labor force. While the use of drones is becoming more popular in agriculture, high cost, including the need for specialized operators and technicians, and access to powerful computers, makes the use of drones inaccessible to most of Brazil’s family farmers. Therefore, the program aims to generate affordable technology solutions for small and medium sized farmers, as well as large industrial agricultural operators. The crop intelligence data produced in real time by the drone flying over the agricultural fields will be delivered to the farmer in an easy-to-read format via an LTE-connected smartphone or tablet. The farmer will then use the data to accurately detect areas in their fields that may have crop diseases and plagues, water stress, nutrient deficits and environmental damage. This will inform farmers which precise measures are needed to avoid the overuse of agrochemicals, over-fertilization, and will allow for selected irrigation of dry fields in order to reduce environmental impact and increase crop yields. “This exciting collaboration with Embrapa, to carefully explore and demonstrate the use of drones for agriculture, is a privilege for Qualcomm,” said Rafael Steinhauser, senior vice president of Qualcomm and president of Qualcomm Latin America, at the inauguration event. “Through our Wireless Reach initiative, we seek to improve people's lives with programs that use wireless technologies, and we are looking forward to the positive impact this program will have,” he added. Qualcomm understands the many ways advances in mobile technology have already strengthened economic and social development and is working to enable even greater transformation in support of innovation and environmental sustainability.